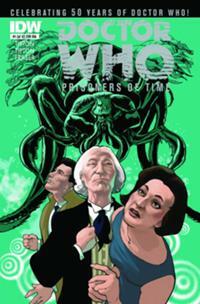 The Fellowship was fortunate enough to obtain a copy of DOCTOR WHO: PRISONERS OF TIME #1 from IDW Publishing. Scott and David Tipton write, and Simon Fraser draws. The Doctor and his companions are taking a little rest from the usual adventure; they’ve decided to take in a lecture from Thomas Huxley (19th century scientist and scholar). But after the lecture they find themselves in a pickle involving a familiar insectoid alien. When the dust settles, though, something important is missing. Something very important. This issue focuses on the first Doctor, who is a gregarious old fellow (unlike some of the later, younger ones). But I hear that this series will show us all of them while they struggle to solve this nasty puzzle. I like this installment; the mystery is pretty quickly solved, and the Doctor is already starting to suspect that something else is going on. It’s a good beginning to what I hope will be an interesting story. The writers have a good feel for the characters, which will be important to the “long run.” I think fans will approve of this first issue, and non-fans (come on, people, get on board) will like it too. It’s a winner. DOCTOR WHO: PRISONERS OF TIME #1 is available now at your FLCS or by order from idwpublishing.com.